Our approach to sales is unique, personal and unconventional of most music “stores”. First off, the products that we offer span from the student just beginning, to the intermediate player on up toward the professional and discerning musician. The pricing is commensurate with the various skill levels and performance abilities (beginning to advanced to professional). When purchasing a product from us, it is quite obvious that we take great care in helping people find a quality instrument that is suitable for the student’s performance ability and playing style, as well as reflective of the price range desired. If we can’t accommodate a request or find a suitable product we have no problem in referring our clientele to others, who we feel confident in their proven reputations to treat the customer right. Second, our approach to sales is unique, in that people make appointments to come in to try out or look at the products we have to offer. Yes, it does discourage the impromptu approach to running out and purchasing an instrument; however, you will be insured of having personalized service in a relaxed atmosphere. You can try out or look at an instrument in a leisurely manner without a hard sell approach AND without people standing around gawking at you as you play or test “drive” an instrument. Trust us, you’ll appreciate the value in our approach. We’d also be happy to explain how this SAVES you $ on the instrument purchases. 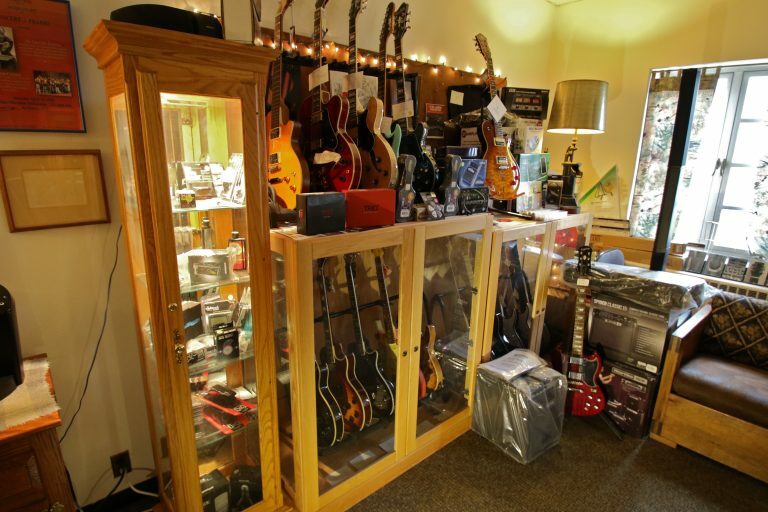 Third, we do have guitar rentals (acoustic & electric) that are very affordable. There are a limited number of rental items. We rent ONLY to those who are taking lessons at our studio. Items sold include: Acoustic and electric guitars (new & used), cases, lesson books, limited number of pop/rock/jazz songbooks, metronomes, keyboards, recording equipment, microphones, cables, guitar accessories, amplifiers (guitar, bass & acoustics), drum pads, sticks and many things can be special ordered at no additional charge. The best days to make appointments are Tuesdays from 4:30 – 8:30pm, Wednesdays from 3 – 8:30pm, Thursdays, 4:30-8:30pm and Fridays, from 3-6pm. Although we are closed most of August, we do make appointments in the second half of the momth. – just check with us by phone 585-223.2310 or, contact us. We now accept credit cards for instrument and equipment purchases. You may of course write a line of credit check. We do have very generous layaway plans! And, yes, our prices are extremely competitive versus the “big box” stores. You’ll be surprised at what we pack into a small space!